GuitarControl.com released a new video guitar lesson from GuitarControl.com instructor and creator Claude Johnson. In this guitar lesson, now available on YouTube.com, Claude Johnson teaches a lesson on how to play major seventh chords on guitar. “It is good to know different chord voicing’s all over the neck”, says Johnson, “your triads, your major and minor chords, and then your dominant seventh, minor seventh and major seventh”. Claude demonstrates the major seventh voicing’s in the key of G by performing four variations on the first three strings. “There is one voicing that I want to look at today”, says Johnson. Claude demonstrates the chord voicing as follows; 10th fret of the 5th string with first finger, 12th fret of the 4th string with 4th finger, 11th fret of the 3rd string with 2nd finger and 12th fret of the 2nd string with 4th finger. “This is a great voicing because you can move it up and down the neck”, says Johnson. 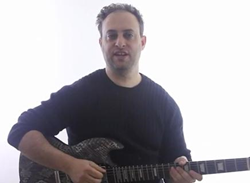 Claude continues this easy beginner rhythm guitar lesson by demonstrating some variations of the major seventh chord voicing that use other notes from the major scale. Guitar TAB’s are available for this easy guitar lesson at GuitarControl.com. A major seventh chord is a chord consisting of a triad plus a note forming an interval of a seventh above the chord's root, a major triad together with a seventh. The major scale, aka the Ionian Mode, is a seven tone diatonic scale that is widely used in western music. The eighth duplicates the first at double its frequency so that it is called a higher octave of the same note, which its name is derived from Latin "octavus", the eighth.